Suppose the unimaginable: What if your child were killed in a hit-and-run? And the one person who knew the driver's identity—his lawyer—couldn't tell you his name because of a legal technicality? Silent Counsel is the story of just such a nightmare. After Stacy Altman's six-year-old son is run down in front of their house, with no witnesses to the tragic accident, she learns that the driver has hired attorney Scott Heller to negotiate a plea arrangement with the prosecutor. But he's instructed Scott not to reveal his name until a satisfactory agreement is in place. The prosecutor refuses to make a deal, and the court rebuffs Stacy's efforts to force Scott to tell her—or even the authorities—who his client is, holding that the information is protected by the attorney-client privilege. When Stacy's stalking of Scott's young daughter escalates into a kidnapping, Scott makes the only reasonable choice a parent can—cooperate and give up the client. That's when Scott discovers that doing the right thing isn't as easy as he thought—and now the mother isn't the only one looking for the child's killer. "[Silent Counsel] boasts a complex story and heart-pounding climax that will have readers looking forward to Isaacson's next." "Ken Isaacson's first legal thriller...is on a par with the works of John Grisham." "Ken Isaacson is an exciting new voice in crime fiction, and Silent Counsel is his stunning debut—a legal thriller with a fascinating twist that will keep you turning pages to the unpredictable conclusion." "Ken Isaacson scares us with the ultimate ethical nightmare: what if you endanger your family just by doing your job? 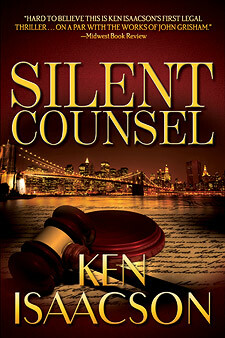 Silent Counsel is a smashing debut, with everything you could want in a legal thriller." "Attorney Ken Isaacson knows his stuff. He knows the ins and outs of legal practice, and he knows the human cost when the system fails. And, best of all, he knows how to put together a book you won't want to put down." "Silent Counsel delivers everything you could want in a legal thriller. A rock-solid debut from Ken Isaacson." "A great premise for a legal thriller: a hit-and-run driver, who can stay anonymous, nevertheless contacts a lawyer toward doing the right thing. But, as Ken Isaacson shows in this haunting and harrowing novel, the 'right thing' has many possible definitions. And consequences. An outstanding debut, and a serious candidate for Best First Novel awards."